Psymoon Records returns with Psychedelic Forms Vol. 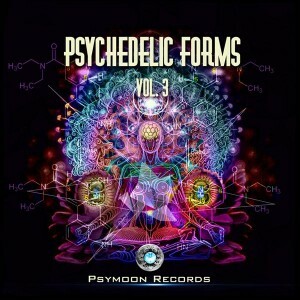 3, the third edition of the series that began with Psychedelic Forms Vol. 1 and continued with Psychedelic Forms Vol. 2. Charting a course into the depths of night-time psychedelia, this release is a complete journey through many styles and tempos with fresh and interesting material showing good ideas and quality. Enjoy! MP3 Download | FLAC Download | WAV Download · Download count: 12,892. Fantastic and very high quality , Nice trilogy to play them all in one big tasty playlist .. hours of psychedelic pleasure !! WTF??!! The artists who made this album has to be very proud!!! The true essence! Tnx, made my new year’s eve! where to find more stuff like Spank The Wave – Panda & Alfa ?? Please tell me what isn’t good on mastering? Love every second of it! Many great tracks, love 12,13,14 tracks. I think they fit amazing with previous music and give that psychedelic spark and feeling of inner peace trough very fast beats, love it! I anticipate 4th release! Great job!